Chanje is making an all-electric truck to compete against medium duty, short-haul commercial vehicles. Deliveries are expected this year. The vehicle is expected to get the equivalent of 50 miles per gallon when fully charged. 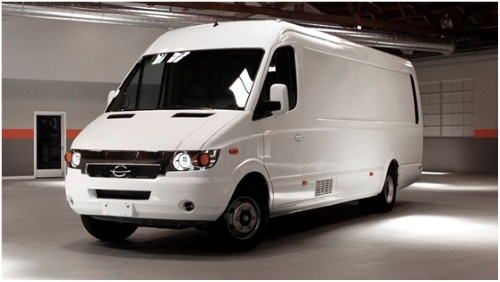 It says the initial Chanje electric vehicle will be built in China, but assembly will transition to the U.S.
Urban dwellers may be used to noisy delivery trucks spewing soot from tailpipes, but Chanje offers an antidote: its V8070 electric delivery van. At 26 and a half feet long, with a payload capacity of 6,000 pounds, the electric Chanje van is designed to handle urban deliveries. CEO Bryan Hansel expresses a progressive desire to "remove noise and tail pipe emissions from delivery trucks in cities", a sentiment that any urban resident should appreciate. He expects Chanje's electric van to be a last mile solution, delivering everything from "potato chips to packages" in cities. Medium duty trucks, such as the model being marketed by Chanje, commonly work out of distribution centers in urban areas, picking up goods for individual delivery that may have come across the country on tractor-trailer rigs.